Hillsboro senior Kristin Jamieson is pictured with varsity golf Head Coach Nathan Boatman at Pickaway Country Club where Jamieson won the D I girls golf sectional by seven strokes. 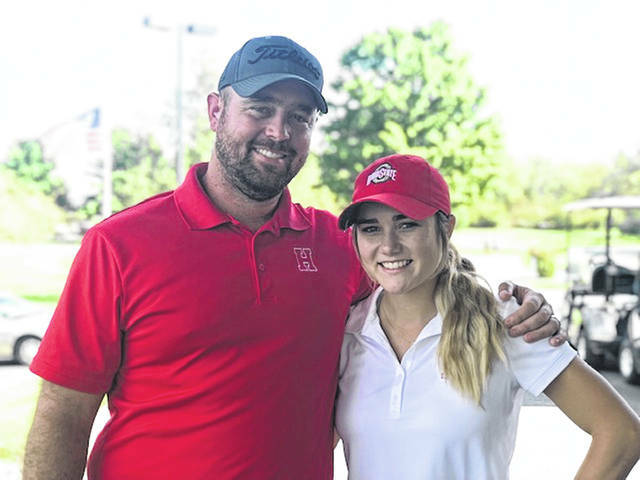 Hillsboro senior golfer Kristin Jamieson returned to the golf course on Monday at Pickaway Country Club and dominated her competition as she shot a 73 in the Division I Southeast Sectional tournament and won by seven strokes. With the win Jamieson earns an individual spot in the D I District Tournament to be held at Eaglesticks Golf Course. Also in the Frontier Athletic Conference the Lady Panthers golf team of Libby Aleshire, Makayla Barnes, Alyssa Butler, Meri Grace Carson and Regan Hagler also qualified for the District tournament with a third place finish. The Ironladies of Jackson also competed in the tournament and finished in sixth place to bring their season to a close. In the Division II girls District tournament the Lady Tigers golf team of Erika Martin, Brianna Weller, Bryn Karnes, Cassidy Willis and Shayna Beatty finished in third place after shooting a combined score of 423. The Lady Tigers season comes to a close with the third place finish as only the top team and individual not on a qualifying team earns the right to advance to the Regional tournament. Fairfield’s Rachel Schuler also competed in the event and finished the 18-hole event with a score of 101 in a tie for 15th. Schuler was the first female golfer in the history Fairfield High School to advance to the District golf tournament. In Division III boys District tournament play the Whiteoak Wildcats saw their season come to a close with a sixth place finish and a score of 382. Zach Harless led the way for the Wildcats as he shot an 85 and finished 16th overall. Jacob Cambell also played well for Whiteoak as he shot an 89 and finished tied for 21st. Lynchburg-Clay’s Tyler Stevens also took part in the tournament and carded a 90 to finish in a tie for 24th. Hillsboro’s boys golf team will be in action on Thursday in the D I boys Sectional Tournament at Crown Hill Golf Course in Williamsport. https://www.timesgazette.com/wp-content/uploads/sites/33/2018/10/web1_Kristin-Jamieson-at-Sectionals.jpgHillsboro senior Kristin Jamieson is pictured with varsity golf Head Coach Nathan Boatman at Pickaway Country Club where Jamieson won the D I girls golf sectional by seven strokes.